Stephan was a valuable team member of the National Research Council of Canada (NRC) Flight Research Laboratory, where he had been a test pilot and researcher for almost 20 years. Stephan was born in August 6, 1962 in Winnipeg, Manitoba, and obtained his glider’s license before he even learned to drive. In 1984, Stephan obtained a Bachelor of Mechanical Engineering degree from the Royal Military College of Canada. He completed helicopter flight training on Jet Rangers in 1985 and was assigned to the 423 Maritime Helicopter Squadron with the Royal Canadian Air Force (RCAF), flying the CH- 124 Sea King out of Shearwater, Nova Scotia and accumulating 1100 hours of flight time. From 1989 to 1990, Stephan attended a test pilot course at the French test pilot school École du personnel Navigant d’essais et de reception (EPNER) in Istres, France. Upon graduation, he was posted to the Aerospace Engineering Test Establishment in Cold Lake, Alberta, where he was involved in the testing of numerous aircraft and system. Stephan came to NRC in 1996, where he spent over 18 years becoming one of the organization’s most seasoned and versatile test pilots, accumulating almost 6700 hours of flying time (over 5000 of those as a test pilot). He piloted 45 different types of aircraft and took part in a variety of high-profile projects, including flights to test many advanced vision systems and augmented control laws, and the development of the flight envelope for the NRC Advanced Systems Research Aircraft, a fly-by-wire airborne simulator. At NRC he championed the use of the variable stability helicopter as an instructional platform for test pilots. Since 1996, he taught a generation of rotary wing test pilots and flight test engineers advanced flight test techniques. In February 2005, Stephan received the NRC Outstanding Achievement Award for his exceptional contribution to the Enhanced Synthetic Vision System project. 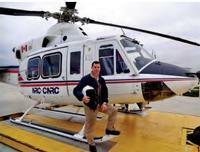 In June of that same year, he was awarded the AHS AgustaWestland International Fellowship Award for his contributions to the Sikorsky/NRC fly-by-wire team. He was awarded The Technical Cooperation Program (TTCP) Outstanding Achievement Award in April 2008 for his role in the “Integrated Visionic, Sensor, and Mission Systems for Day, Night, All-Weather Rotorcraft Operations” project. In December 2012, Stephan received the Royal Aeronautical Society (RAeS) Bronze Medal for his work leading to advances in aerospace, as well as the coveted RAeS Alan Marsh Medal for his outstanding contribution to helicopter research, development and safety. Stephan Carignan passed away on September 14, 2014, following a battle with cancer.